“For our gospel did not come to you in word alone but also in power and in the Holy Spirit and with much conviction” (1 Thess 1:5). In ancient times the city of Thessalonica was an important trade city situated along the Via Egnatia, the Roman Empire’s major east-west thoroughfare, running from Byzantium to the Adriatic Sea. The city held status as a self-governing city (like Paul’s native Tarsus) and was inhabited by many Greek-speaking Jews. There Paul and his disciples Silas and Timothy preached the Word of God to the Thessalonians who accepted the teaching of the missionaries and welcomed the Spirit into their nascent church. During their visit the missionaries lodged with a believer named Jason. They remained in the city for less than a month. On three successive Sabbaths, Paul ascended the pulpit in the synagogue and preached that the Messiah had to suffer and die and be raised from the dead to take away the sins of the world. “This is the Messiah, Jesus, whom I proclaim to you,” Paul said. His preaching was forceful but focused and powered by the Holy Spirit and Paul had only to be the herald who announced God’s Word. The Word of the gospel that he proclaimed to them was not just ordinary speech, but was filled with the power of the Holy Spirit and was, therefore, convincing to hearers. The word of God was effective because the Holy Spirit was operative in it. The other factor in the success of the gospel among them was the example given by Paul and his companions in their actions on behalf of the community (Havener, Ivan, OSB. “1 Thessalonians.” Collegeville, Minn.: The Liturgical Press, 1992, 1151.). Many Thessalonian Jews in the synagogue came away convinced and converted to the faith. So did a number of Greek worshippers, and “not a few of the prominent woman” (Acts 17:4). Others, however, driven to jealousy and rage, formed a mob, and “set the city in turmoil.” They stormed the house of Jason, looking to seize Paul and to bring him before the magistrate, but they could find neither him nor his companions so they apprehended Jason and turned him in instead. Paul and Silas, meanwhile, slipped from the city by night and fled to Beroea. Despite hardship, the evangelizers would not be dissuaded. Straightaway they entered the synagogue at Beroea. This time, Luke reports, the Jews were more open-minded. “For they received the word with all willingness and examined the scriptures daily to determine whether these things were true” (Acts 17:11). Before Paul met Jesus (see Acts 9:5b) he had persecuted members of the Way even unto Damascus, a city far outside the jurisdiction of the temple authorities. Now the zealous Jews from Thessalonica, those same ones that ran Paul, Silas and Timothy out of town, learned that the missionaries continued to preach in Beroea and so they followed them there to instigate more chaos. “So the brothers at once sent Paul on his way to the seacoast, while Silas and Timothy remained behind (19:4). Now Paul could add another calamity to his record to boast of Christ Jesus working through him in the Spirit, a list of challenges he faced in proclaiming the gospel. He felt lucky to have survived, but he never forgot the community of believers that had welcomed him so warmly. The Word of God indeed had penetrated Thessalonica and the apostles celebrated but acknowledged that the victory was the Lord’s. “For our gospel did not come to you in word alone but also in power and in the Holy Spirit and with much conviction” (1 Thess 1:5). Paul lamented that he could not have spent more time with the Thessalonians to teach them more about the faith. During his missions to Athens and Corinth, he became aware of how well they had received his preaching yet he wanted to teach them more and to respond to their concerns. Paul would have returned to them but having been hindered from doing so, the best alternative was to write them a letter. 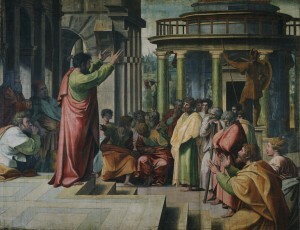 Saint Paul’s First Letter to the Thessalonians is believed to be the earliest New Testament writing. First Thessalonians is the thirteenth book of the New Testament and the first of the thirteen letters that Paul wrote to the churches he helped found in the first century. Paul’s letters are usually characterized by the warm personal relationship between writer and reader—he knew his audience well. The epistles to the Thessalonian church display this clearly. The letters give special insight into his missionary activities, what he empathized in his teaching and how he preached. Paul wrote these letters during his second missionary journey, less than twenty years after the Resurrection. On that journey, he entered Europe for the first time, and the Macedonian city of Thessalonica was his second stop. The Apostle composed the first epistle around AD 50-51, less than a generation after Jesus’s death. The lectionary in the liturgy uses this letter at the end of the liturgical year because of its teaching on the Parousia. Paul wanted to remind his readers not to grow complacent or to forget about the Lord’s return. At that time, the gospel was being handed on orally; the full written versions of the stories of Jesus did not then exist. Neither did any of Paul’s other letters. The letters he addressed to the Thessalonian church were read before the assembly gathered in homes for worship. These inspired writings produced by the Apostle under the direction of the Holy Spirit shed light on the way the first generations of Christians, for Paul reminds them of the essentials of the faith: the greatest commandment: to love the Lord with total mind, heart, soul, and strength. Both epistles, especially the first three chapters of the first letter, display Paul’s great work of evangelization in Thessalonica—a word that is the model of how the gospel should be proclaimed. Paul arrived in the city to sow the seed of salvation but before he could see it take root the Jews rose up and drove him and Silas out. Only later did he hear of the faith through other missionaries, and he sent Timothy back to Thessalonica with the successive letters, for they had become known as the faithful church throughout the world. By fulfilling the two great commandments—love of God, love of self and neighbor—the new Christians became models of faith and imitators of the Lord as demonstrated by Paul and Silas and their missionary companions. The Word came to Thessalonica in the power of the Spirit, to chase away the idols and evil spirits and to bring them to conversion by imitating Paul and the disciples and Christ. Paul remained gratified by the community he fostered in Macedonia. “We ourselves boast of you in the churches of God regarding your endurance and faith in all your persecutions and afflictions” (2 Thessalonians 1:4). He gave thanks to God for the active faith that took hold in Thessalonica. The core of his apostolic preaching is that the good news foretold by the prophets was brought to fulfillment in Jesus Christ. The attitude of the preacher plays a fundamental role in evangelization. What is said is important but so is how the preacher delivers the message. Paul made it a point to remain in the background: his words and examples are important but it is the Holy Spirit that moved the hearts of the Thessalonians. Paul simply passed on the Word simply and faithfully.